A PLUMP CRIMSON SUN HANGS low in the Summerville sky. Sunbeams playfully caress the tops of Palmetto trees while the sound of children-s laughter echoes through the streets. The aroma of barbecue lingers in the air as neighbors chat between sips of freshly brewed sweet ice tea. These are not the sights and sounds of yesteryear but of a new community by Saussy Burbank called White Gables. "New urbanism has been a buzzword since the late 1990s, meaning homes are closer to the street and closer together, with sidewalks to promote community closeness," says Keller Williams Realtor T.J. Trimeloni. A five-mile trail beckons neighbors to enjoy a brisk walk past brightly colored homes, sparkling lakes and ponds. All homes have fiber cement siding that resembles wood siding and comes with a 50-year guarantee. One- and two-car garages are optional. The detached garages are placed toward the rear of the lots and are accessible through an alleyway. "Trash and recycle bins are located in the service alley, too. This keeps the front part of the home clean and uncluttered," says Trimeloni, an agent specializing in the Summerville and Greater Charleston areas. Other options include sunrooms, gourmet kitchens and additional bedrooms. Buyers can also choose from a number of pre-owned homes. White Gables features a community clubhouse, large pool, children-s pool, basketball court, tennis court, large playground and two common areas. 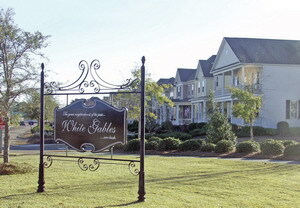 White Gables is a diverse community, "great for just about any lifestyle," says Trimeloni.